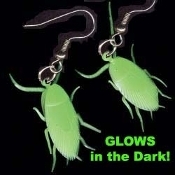 Glow-in-the-Dark COCKROACH EARRINGS - Gross Halloween Roach - Gothic Insect GID Charm Bug Novelty Costume Jewelry - Realistic, HUGE COCKROACH. Rubbery Plastic Charms, each approx. 1.75-inch (4.38cm) long. Great exterminator entomology entymology gag gift! *Needs no batteries. Charges in Bright Light!